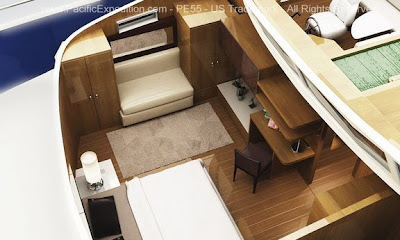 You’re looking for a fast, long range, strong, safe, well built, stable power catamaran designed for adventure then check Pacific Expedition Yachts website. The yard, with 20 years experience in strong boat building, has created a range of trawler style catamaran : the PE 45, PE 55 and the PE 65. 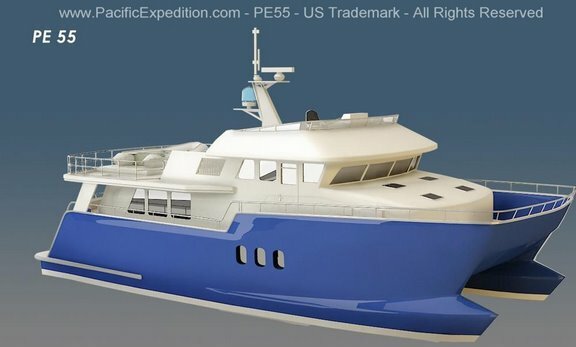 When I went through their website and saw that the Yard was based in Oregon (look at the beautiful pictures it is is amazing) I thought to myself : they must build trawlers designed for tough conditions, for expeditions and adventurous lifestyle. When I kept on reading the literrature and their blog, looked at the pictures I thought endeed the guys know what they are talking about and don’t mind to share their experience. I like that. 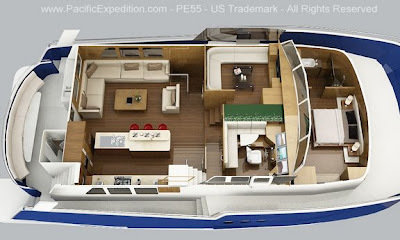 Of course the PE are spacious, that what cats are for, but the PE are really really spacious just take a look at the 3ds of the PE 55 : three staterooms, four heads, full laundry and a stand up engines room. 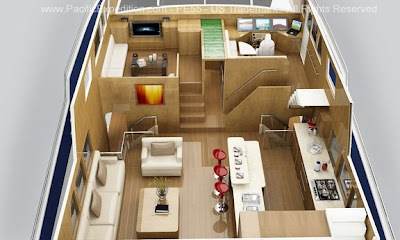 With a range of 3000 miles at cruising speed, the semi-displacement hulls are very economical to operate. Maximum speed will reach 20 knots. All the 3d of the 45 and 55 are available in Picassa. I think that for their PE 65 project they shoud have two design options, classical and modern. I was recently having a phone conversation with a yacht broker from Fraser Yachts in Monaco. He told me marketing and buying a boat is only a question of trust and confidence between people. “We really like boats but we love people. People come first, family, employees, clients are always put first and we design boats only to support and protect those we care for and enjoy spending time with”. Boating should always be a question of trust and confidence between people. Any over kind of relationship in this business is doomed to fail. I think this has to do with the fact that boats goes out on the sea, and when you are out there you can’t cheat. There are so many things to discover and read on the Pacific Expedition website, I let you have a look at it. This entry was posted in pacific expedition, PE 45., PE55, PE65. Bookmark the permalink.